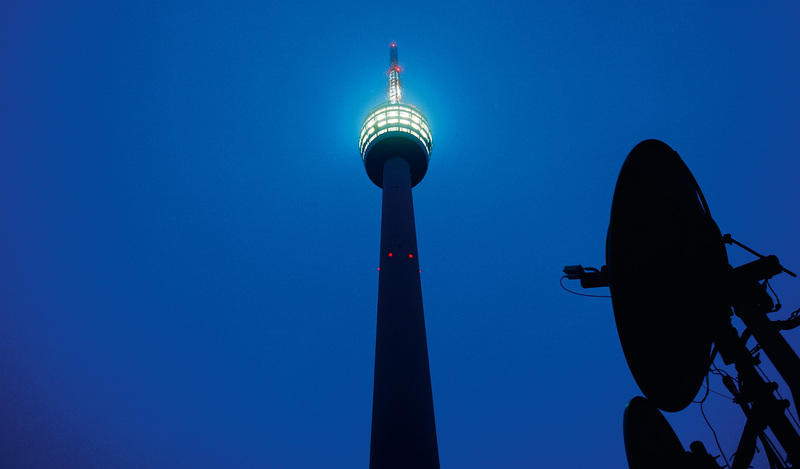 Stuttgart's Television Tower, with its height of 217 metres, was the first of its kind in the world, and thus the prototype for many other television towers. Acknowledged as an aesthetic and architectural masterpiece, this forerunner with its timeless design remains unparalleled up to the present day. The Stuttgart Tower set off a global chain reaction of tower construction. There are now hundreds of television towers all over the world, though the Stuttgart original remains unique in its harmonious proportions. Whereas the tall chimney stacks built in the 1950s had foundations of heavy, solid slabs, for the Television Tower Fritz Leonhardt conceived for the first time a ring foundation with a core diameter of 27 metres, which has the effect of considerably reducing sway. In order to prevent the ring foundation from bursting under a load of 4500 tonnes, a radial wire bundle of high-strength steel was used. Similar to the spokes of a bicycle wheel, the tendons stabilise the ring foundation by keeping it under tension. The tensioning wires are protected from ground water corrosion by means of a thin concrete slab. The transition element between the foundation and the shaft is a truncated conical shell, which transfers the loads and wind strain to the ring. At an angle to it and upside down, as it were, in the interior of the foundation, there is a second conical shell. This shell abuts the upper rim of the outer one, with its apex embedded in the central base plate, making for a solid, extremely stable construction. Fritz Leonhardt wanted to conceal the broad foundation under ground level. The gracefulness of the structure was not to be spoilt by a massive base, as in the case of later towers in East Berlin and Moscow. The constructor, Fritz Leonhardt, incorporated numerous safety elements. As he later said: "We calculated the Stuttgart Tower with an excessive safety margin, because this was as yet uncharted territory." 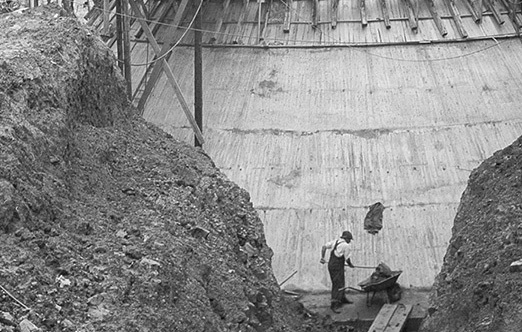 The Tower shaft is basically a reinforced concrete tube held by the foundation structure. The external diameter at the base of the Tower is 10.80 metres, tapering to 5.04 metres below the pod. The narrowest part must still be wide enough to accommodate the two elevators, emergency stairs and ducting. The Tower owes its graceful, harmonious appearance to the parabolic curve of the shaft. Its upwardly tapering form is therefore not absolutely straight, but deviates from the line in a barely noticeable concave curve. Trees don't grow ramrod-straight either. Another detail is also modelled on nature: the relatively thin walls of the concrete tube are fortified on the inside at ten-metre intervals by transverse frames. The same principle can be found in the tall stems of the bamboo plant. Wind pressure, sunlight and drops in temperature can cause the Tower to oscillate. A basic sway takes about 5 to 6 seconds. Despite this, even in severe storms the greatest deflection of the shaft from the axis is not more than 30 centimetres. The end of the transmitter mast, on the other hand, can sway up to 1.50 metres. However, there is no danger that the Tower might collapse. The basic shape of the pod was predetermined: a circular-cylindrical form generates the least wind resistance. In order to improve flow conditions, the top and bottom edges were considerably rounded. 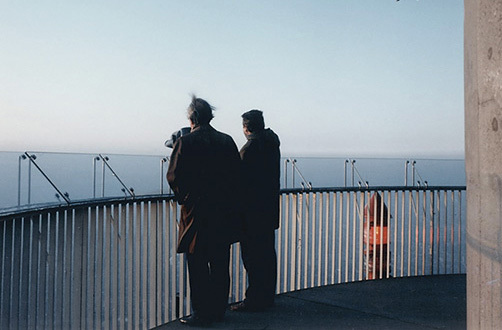 This chamfering has two additional advantages: it spares visitors unpleasant wind noise and prevents them from looking straight down from the observation platform. In order to make the construction look graceful despite its weight, the outer skin was covered in smooth aluminium cladding, a façade which makes the Television Tower as streamlined as an aeroplane. It is even immune to gales. A hurricane-force wind of 170 km per hour subjects the Tower to a wind pressure of 172 tonnes. Compared with the Tower's total weight of 4,500 tonnes and the earth pressure on its foundations of 3,000 tonnes, 172 tonnes are not enough to pose a threat. The Tower pod consists of four levels. 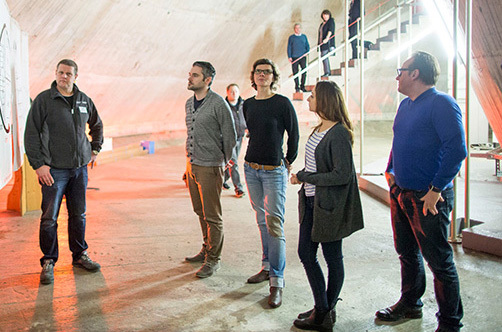 The bottom floor, at a height of 138 metres, contains the technical equipment. Up until 1974 it housed the television transmitter. After this the third generation of television transmitters was relocated in the operations building at the foot of the Tower. This was possible because new, high-frequency cables with low attenuation were now able to bridge the long distance up to the antenna. 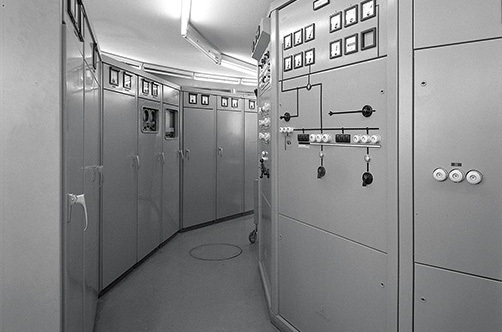 Today, the former technology floor contains the Tower's technical equipment, various radio links, mobile telephone systems and police transmission apparatus. From the beginning the two uppermost levels had been planned as visitor decks, because a restaurant would only be viable if large enough. The floor below contained the kitchens. 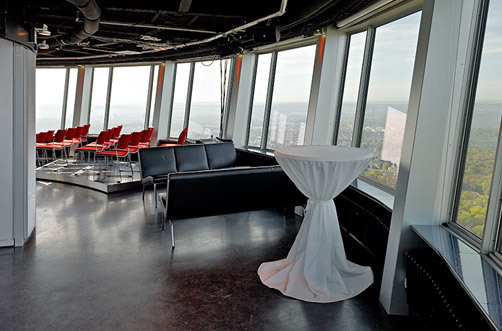 Following the renovation of the outer cladding of the Tower in 2005, the kitchens remained a shell, while the former restaurant became an event area for all kinds of functions. Today the top floor contains the café and bar. At a height of 150 metres there's a two-tiered observation platform. The second tier was built especially for children, as the 1.30-metre-high parapet would otherwise have prevented them from enjoying the view. The Stuttgart Television Tower's transmitter mast is a riveted, square lattice mast composed of angle sections. 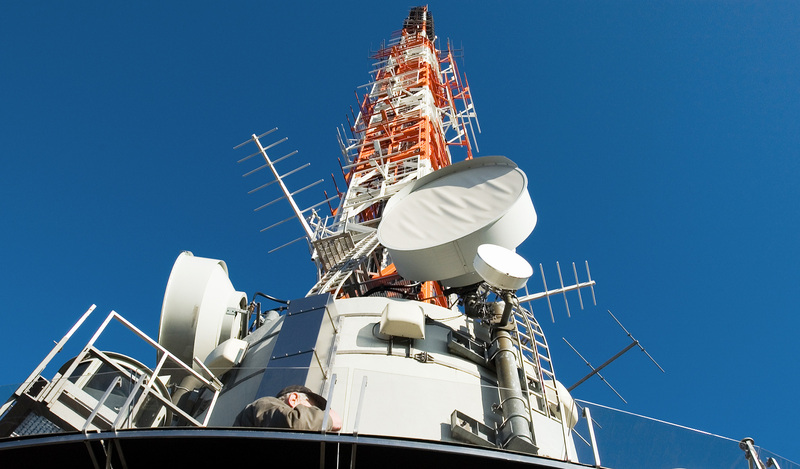 The lower VHF section is 32 metres high and 1.90 metres wide, while the 19-metre-high upper section is only 1.29 metres wide. The mast weighs 48 tonnes. 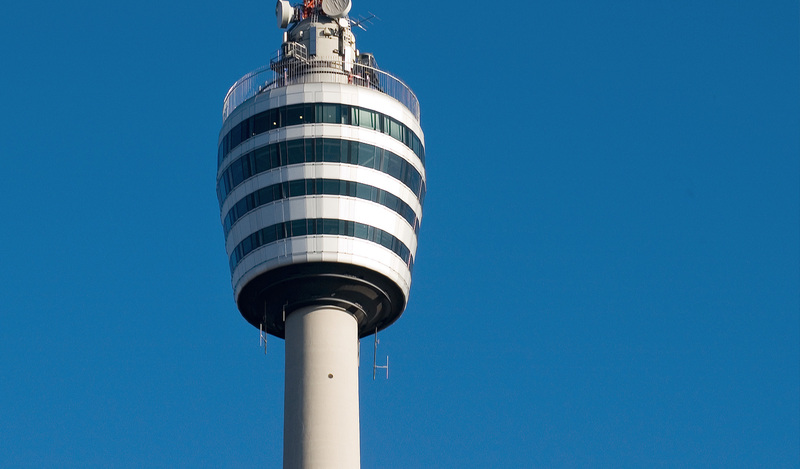 Although the Tower guaranteed good television reception in the Greater Stuttgart area from 1955 onwards, there were still occasional complaints about poor viewing quality in certain parts of the city. For this reason the Süddeutscher Rundfunk increased the height of the steel lattice mast in 1965 by 3.8 metres. The Tower is now 217 metres high.